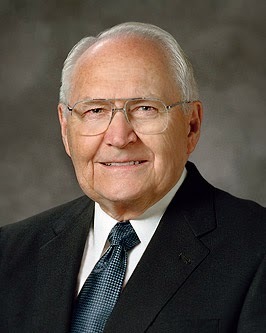 Elder L. Tom Perry (1922- ) has served as a member of the Quorum of Twelve Apostles since 1974. "We are in the midst of an information revolution, the so-called information age, with all of its new challenges and opportunities. Now we are being flooded with information. For many, television is robbing them of valuable family time. The Internet is a new source of information that offers tremendous opportunities as well as another potential—becoming addicted. Unfortunately, with the blessings of the new information age also come challenges, as evil influences have a new medium of transmission and new ways of infiltrating our minds. Worldly influences enter our homes in new shapes and forms to challenge our resolve to use our time wisely and for the Lord's purposes. "Perhaps we could take a page out of the law of ancient Israel and call 'time-out.' Let us make a list of those basic activities that add value to eternal man and woman and determine... that we will discontinue those activities that are of little value and worth that might even jeopardize our eternal welfare. Let us place higher priority on family prayer, family scripture study, and family home evenings and eliminate those activities that fill our lives with worldliness and evil." Welcome to "The Information Age" — did you know you were part of a world-wide revolution? Elder Perry recognizes the many blessings these new technologies and the accessibility of information can bring, but also warns of the challenges. Elder Perry's suggestion to take time to consider our activities is a very wise one. Which of the things we devote our time to are those that "add value to eternal man and woman" and which "are of little value and worth that might even jeopardize our eternal welfare." It's clear that there are some activities that we MUST NOT allow to be pushed aside by those of lesser value! This kind of self-evaluation would be a wise exercise for each individual and family to undertake periodically.